Kenia and Pocahontas. Pocahontas is tyring to look innocent, while holding back a laugh.. HD Wallpaper and background images in the डिज़्नी क्रॉसोवर club tagged: pocahontas kenai. This is cute. It's like they're going to have their picture taken. "Pocahontas, Brother Bear, what have the two of you done?" Chief Powhatan interceded, acknowledging his daughter and the Inuit man gallivanting about their own presence. "Father!" Pocahontas exclaimed, realizing that the chief of the Algonquian tribe now stood before them. "I'm sorry, Chief Powhatan." Pocahontas fidgeted nervously. "Kenai and I are at fault," the color rushed to her face. "You could say that again," Kenai chuckled under his breath. "Sh!" Pocahontas swiftly jabbed Kenai in the ribs. "Be sure to harvest food for the coming months, both of you. Denahi, Nakoma, and Sitka have already made way," Chief Powhatan commanded. "Yes, father," Pocahontas complied with her father's request. Once the chief of the Algonquians stepped back into the village, Pocahontas and Kenai found themselves alone once again. "Ouch, Pocahontas! Why the Great Spirits did you do that?" Kenai retorted, rubbing the area where Pocahontas had nudged him affectionately. 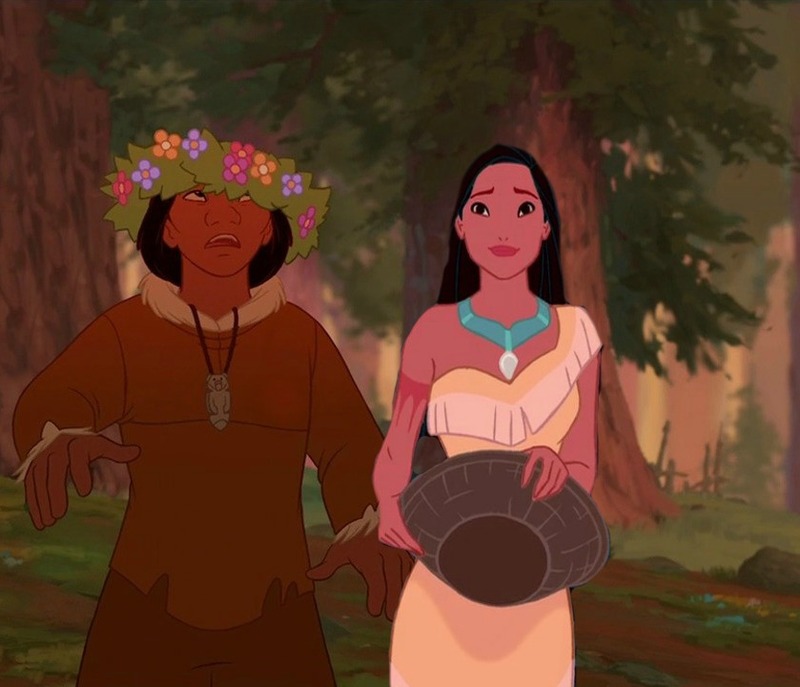 "Don't mind that Brother Bear, quickly, follow me," Pocahontas took Kenai's palm in hers. Dusk had finally set before Kenai and Pocahontas arrived at a sacred waterfall her people had dubbed the Mysterious Falls. "Oh, isn't it beautiful, Kenai?" Pocahontas whispered to the environment before her. "Ahem," Kenai cleared his throat anxiously. "It's lovely,"
"Have you ever been to the peak of the Great Spirits before, Kenai?" Pocahontas diligently inquired. "No, I haven't," Kenai thoughtfully replied. A moment of silence hung throughout the air. "But we could go there, if you'd like. I heard -"
Pocahontas then lunged herself at an unsuspecting male. "I would appreciate that of you, Brother Bear," Pocahontas embraced the Inuit passionately. Kenai, stunned by the woman's actions and close intimacy of their contact, swallowed a tight lump forming within his throat. "Y-Yeah? I bet that'll be a night to remember," Kenai defused the tension. Pocahontas freed her grasp and looked into the man's swirling auburn eyes, yearning for something more. "We must go. Promise me?" Kenai held out the smallest digit of his hand and encircled his with hers. Haha, I love Pocahontas' expression.